From Hwy-41: Hwy-41 to Hwy-49 West. Follow Hwy-49 West into Waupun. 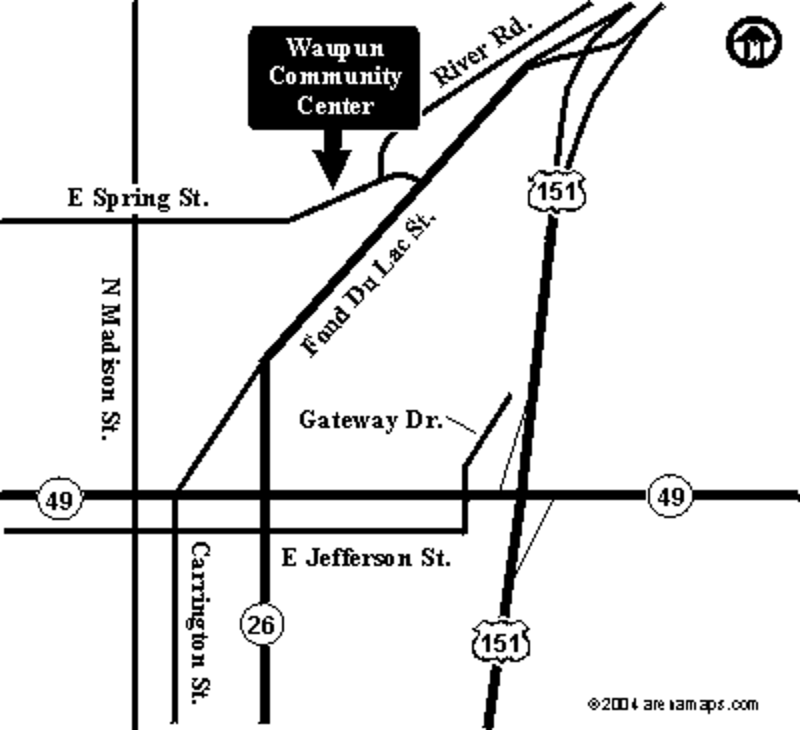 Turn right on Hwy-26 in Waupun. Hwy-26 veers right and joins Bus-151. Follow this for a few blocks. Once you cross a small bridge, turn left on Spring St. The arena is one block on the right. Highway 41 North to exit 144/Ballard Road. Turn right on North Ballard. Turn right on Witzke Blvd. into Memorial Park. Rink is on the left side. Highway 26 south to Watertown to Highway 16 east. Take highway 16 through Oconomowoc and continue east. Highway 16 will turn into a 4-lane highway east of Oconomowoc. Take the North Avenue exit and turn left. Turn left into the high school at Arrowhead Drive (third or fourth street) and turn right at the stop sign. Rink will be on the right (northeast corner of campus). Highway 68 west to highway 33 west through Portage. Continue on highway 33 west to Baraboo where highway 33 will turn into 8thAvenue/Ringling Blvd. Continue on 8th Avenue and turn left on South Blvd (second stoplight). (You will go through downtown Baraboo.) Go under railroad viaduct and after two blocks veer left onto Parkway. Go about 6-7 blocks to Pierce Park located at bottom of hill. Turn into park and follow road past baseball fields to rink. Highway 151 south to Highway 33 exit. Turn right at first stoplight by McDonalds and go past Shopko. Turn right onto Prospect and then turn left onto School Street. Rink will be on the left. Highway 26 north to Highway 41 and go north until Business 41 by De Pere. Take Business 41 into De Pere. Turn right onto Parkview Road to Fort Howard. Turn right onto Fort Howard Avenue. Rink will be on the left. Highway 49 east to Highway 41 south to Highway 45 south. Take the Capital Drive exit (exit 44) and go west on Capital Drive approximately 3.5 miles to Calhoun Road. (Water tower will be on the right.) Turn south (left) on Calhoun. Approximately 1.5 miles and rink will be on the left side. Highway 151 to FDL to Co Rd V. Turn left onto Co Rd V. Continue on Co Rd V to Fond du Lac Ave. Left on Fond du Lac Ave. and proceed to fairgrounds. The rink will be on the left side. Take Highway 41 north to exit 164/Oneida Street. Go east on Oneida Street to Packer Drive. Turn right onto Packer Drive to the arena. Rink will be on the right. Highway 26 to Highway 41 and go north towards Green Bay. As you are passing DePere, take the Main Street (County G) exit and turn left. Stay on Main Street approximately 3 miles until the end of Main Street. Turn left onto Fernando Drive and rink will be on the right. Highway 26 to Janesville. Turn onto I-90 east. Take Highway 11 exit off of I-90 (second exit) Racine Street. At the bottom of the hill turn left onto Palmer Drive. Follow Palmer Drive thru Park to Beloit Avenue (Main Street). The rink will be on the corner of Palmer Drive and Beloit Avenue. I-94 south to Rt-165 (exit 347/first Wisconsin exit). Turn left on Rt-165 and proceed east approx. 1.5 miles to Prairie Springs Park on the left. Turn left into the park and follow the road to the right. the arena is adjacent to the Lakeview RecPlex complex on the east side of Lake Andrea. Highway 151 South (East Washington Avenue) to Johnson. Right on Johnson which merges into Gorham Street, which merges into University Avenue. Continue on University Avenue to Randall Street. Turn left onto Randall Street and go four blocks to Monroe Street. Turn right onto Monroe and proceed one block to parking lot located between the stadium and the shell. Another parking lot is located behind stadium. Take Highway 151 west to Madison to I-90/94 south. Take I-90 to US 12/18 (exit 142). Go west to MC (Coliseum exit) and go right to first stop light and then turn left to the Coliseum entrance. Highway 151 to Madison. Stay on Highway 151, which turns into East Washington Avenue. Go until Aberg Avenue (airport turnoff) and go north (right) to Packers Avenue. Turn left just pass overhead. Proceed past Kraft-Oscar Meyer Plant and take right onto Commercial Avenue. Rink will be on right side approximately one block. Highway 151 west to I-90/94 south. Take I-90 to US 12/18 (exit 142A) and go west to Whitney Way. Turn left on Whitney Way. Go under overpass and take an immediate right on Schroeder Road. Proceed to Forward Drive and turn right. Rink will be on right side, next to baseball field. Highway 151 west to Madison to I-90/94. Take I-90 south to US 12/18 and go west (exit 142A). Go to US-51 (exit 266) and go south to Siggelkow Road and turn left. Go to Marsh Road and turn left. One block to rink. Highway 151 west to I-90/94 south. Take I-90 to US 12/18 west (exit 142A). Take US 12/18 approximately 16 miles to US 14 W/University Avenue (exit 251). Take US 14/University Avenue west about 1 mile to Pleasant View Road and turn right. Take an immediate left and follow Evergreen Road for approximately ½ mile. Stay straight at the fork in the road going up the hill. Capital Ice Arena is on the left side of the road. Highway 41 south to Milwaukee to Highway 45 south. Take Highway 45 to I-94 and go east. Immediately get into right lane and 84th Street exit. Turn right on 84th Street. Get into left lane and entrance will be on the left. Highway 49 east to Highway 41 south to Highway 45 south. Take I-894 east towards Chicago until 27th Street exit (exit 241). Turn left on South 27th Street. Go to West Howard Avenue and turn right to 20th Avenue. Turn right (south) to Wilson Park entrance. Turn left into park and follow to ice rink. Highway 41 south towards Milwaukee. North of Milwaukee, take Main Street exit (exit 50 A-B) onto WI- 100 east toward Main Street East. Main Street turns into Brown Deer Road. Go east on Brown Deer Road (approximately 6.5 miles) past Highway 57 ro Range Line Road (stop lights). Turn left and go about ¾ mile and turn right on Fairy Chasm Road. Go ¼ mile and turn left into first school entrance. Sign says “Field House” entrance. Highway 26 south towards Watertown to Highway 16 east. Go through Oconomowoc and continue on Highway 16 east until Highway 83 exit and turn right. Take Highway 83 south approximately 3.5 miles to Golf Road which is just before I-94. Take a right and rink will be on right across from McDonalds. Highway 151 east to Manitowoc. After crossing I-43, go to County Road (first stop light) and turn left. Proceed approximately ½ mile to Expo Drive and turn left. Turn left on first road that goes to left and proceed to fairgrounds. At the end of the road, turn right and proceed to Manitowoc Ice Center. Highway 26 north to Highway 41. Go north on Highway 41 to Neenah and take Highway BB/ Prospect Avenue exit. Turn left on BB and go under Highway 41. Turn left onto American Drive and continue until Shady Lane Road (approximately 1 mile). Turn right on Shady Lane Road and rink will be on the right. Highway 49 east to Highway 41 south until Highway 60 off ramp by Slinger and turn left. Follow Highway 60 to County Y (about 8 miles) and turn right. Go south until County C (about 2 miles), which is the same as Pioneer Road. Turn left and go approximately 2 miles to Cedarburg and rink will be on right side. Highway 26 north to Highway 41 north towards Oshkosh. Take the Highway 44 exit and turn left and go west approximately 1 mile to Highway 91 and turn right. Take next right which is Oakwood Road. Proceed on Oakwood Road until 20th Avenue (stoplights) and turn left. The YMCA rink is approximately ¾ mile on the left side. An alternate route is to take County M north to Pickett. Turn right on Highway 44 east toward Oshkosh. Go to first stoplight which is Highway 91 and turn left. Turn right on Oakwood Road and proceed until 20th Avenue. Turn left on 20th Avenue and rink is approximately ¾ mile on left side. Highway 26 north to 41 north to 47 north (which is on the north side of Appleton). Stay on Highway 47 which will join with Highway 29. Highway 47 and 55 will be the first exit into Shawano off of Highway 29. Take this exit and go until Green Bay Avenue and take a left. Go on Green Bay Avenue until Waukechon Street and take a left. The rink is on the right side of Waukechon Street. Highway 151 west to Highway 41 and north to Highway 23 exit. East on Highway 23 through Fond du Lac and proceed to Sheboygan. Go past Highway 43 and turn right on Taylor Drive. Take Taylor Drive until New Jersey Avenue and turn left. Proceed to Wildwood Avenue (across from baseball field) and turn right. Go to the end of Wildwood Avenue to rink. Highway 151 west to I-90/94 south. Take I-90 south (past US 12/18) to County N (exit 147) and turn right. Go approximately 6 miles to highway 51 and turn right. Proceed into Stoughton until the first stoplight which is Fourth Street and turn left. Proceed approximately four blocks (crossing bridge) and turn left into fairgrounds. The ice center is the largest building on the fairgrounds. Across from the fair stands. Highway 151 west to Sun Prairie. Take Highway N/Bristol St. exit and take a left. Proceed to Main St. and take a left. Proceed to Grove St. and take a right. Rink is on the right hand side. I-94 west towards Madison. Take I-94 until Bluemound Road exit (Highway 18 east). Turn right on Bluemound Road (Highway 18 east) and proceed approximalty ½ mile. Rink will be on left side across from Best Buy. Highway 49 north through Ripon and Berlin to Highway 10. Go west on Highway 10 to Highway 54 exit and go west on Highway 54. Turn right on Grand Seasons Drive/ Farmsite Road and Expo Center will be on left. Highway 51 to exit 192. Take highway 29 west to the Marathon Park Fairgrounds. The rink is in the Multi-Purpose Building. Highway 49 west to Highway 41 south. Turn off on Highway 33 and go east. Continue until Highway 45 and go south until Paradise Drive exit and turn left on Paradise Drive. Continue to stop lights and turn right on South Main Street. Go approximately ½ mile and rink will be on right side just over the hill. Highway 68 west to Highway 33. Continue on Highway 33 through Portage to I-90/94 north. Continue to Lake Delton Highway 12 exit (exit 92) and turn right. Get into left lane and turn left onto Progressive Drive. Follow signs to rink. County AW to Highway 73 and go north through Plainfield. Continue on Highway 73 to Wisconsin Rapids. Take Highway 13 north to Pepper Avenue and go east on Pepper Avenue until 16th Street and turn right. Rink is on the left. If you have changes/updates to any directions in this directory, please let a board member know.